For a true insider glimpse about what it's like to call Villa St. Benedict home, listen to these residents share their impressions. 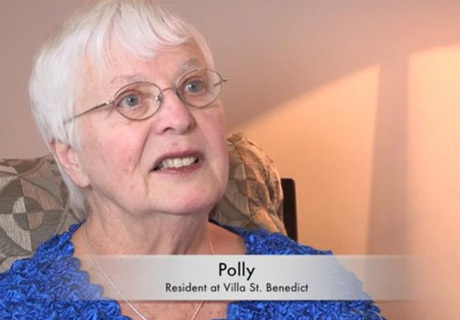 Long-time resident, Joy Wilcox, details her daily life and explains why Villa St. Benedict was the perfect choice for her to be able to continue the lifestyle she designed for herself.
" I love living at Villa St. Benedict because the community has so many different ways for me to pursue my interests." "I have been a resident here for 9 years. I am a graduate from Indiana University, and was a buyer at Carson Pirie Scott before I started my own estate business that I owned and operated for 42 years. I love meeting people and I take advantage of the many volunteer opportunities available on campus. I've found my niche in the VSB gift shop where I work twice a week and am responsible for buying the cards and candy. There are many ways to volunteer here such as working in the library, helping at daily on-site Mass, escorting wheelchair- bound residents to activities, making Christmas ornaments for overseas military and so much more. There is also a variety of resident activities such as Wii bowling, singing, meditative coloring, bingo, bridge and poker. I enjoy using the state-of-the-art fitness center and attending many entertaining and educational programs. Everyone is able to find something to get involved in here. There's no way to be bored, so tell your kids that you will call them when you have the time!" "There are many reasons that I'm so satisfied with my choice to move to Villa St. Benedict." "This was not my children's choice, but my own personal one. I love the safe and private grounds, and park-like setting. I really can't leave anyone out in my praise for the staff, and my fellow residents. Everyone is kind, friendly, and helpful. It's wonderful to have 24 hour security and a friendly concierge staff. I also can't say enough about our wonderful housekeeping and maintenance staff. They are so polite and always willing to help, not to mention everything is clean and safe all the time! I also enjoy many activities through our Life Enrichment programs, and I take advantage of our state-of-theart fitness center." On the grounds: "It's beautiful! It's like living in the middle of a big forest..."
On the Center for Lifelong Learning: "I want to take every course!" "I just can't say enough good things about this community!"